The partnership between cognac brand Hennessy and New Irish Writing goes all the way back to 1968 when editor and writer David Marcus had the brilliant idea of launching a page to publish fiction and poetry by new and emerging writers in the Irish Press. And so, the first Hennessy Literary Awards took place in 1971, dramatically raising the profile of the New Irish Writing page by bringing in internationally famous authors to judge the work of promising, but virtually unknown, writers. Elizabeth Bowen and William Trevor judged the awards in that first year, launching winners like Kate Cruise O’Brien, Desmond Hogan and Dermot Morgan to find publishers and develop distinguished writing careers. The backing of Hennessy ensured the continuation of the New Irish Writing page in the Irish Press until April 1988, when it was dropped as a result of publishing difficulties that eventually led to the closure of the paper. “Hennessy played a key role in negotiations that led to the page moving to the Sunday Tribune under my editorship,” notes Carty. “Hennessy also agreed to revamp the awards, introducing a special fiction award and a New Irish Writer of the Year Award, which in the inaugural year was won by Joseph O’Connor with his first published story ‘The Last of the Mohicans’.” The judges Brendan Kennelly and Piers Paul Reed predicted that “any publisher would put money on him as someone with the potential to become an important writer”. The following year Colum McCann repeated O’Connor’s success with his first published story ‘Tresses’. A major milestone in the sponsorship was the introduction of a Hall of Fame Award in 2003 to celebrate the achievement of writers discovered and given their first chance by the New Irish Writing page who went on to become major authors. Bernard MacLaverty won this year’s award. Previous winners include Sebastian Barry, Patrick McCabe, Neil Jordan and Frank McGuinness – in addition to O’Connor and McCann. “It is fair to say that without the continued support of Hennessy the New Irish Writing page might not have survived to reach its 50th anniversary this year, finding a new home with the Irish Independent in 2011 after the closure of the Sunday Tribune and then successfully moving to the Irish Times in 2015,” says Carty. Manus Boyle Tobin was named the Hennessy New Irish Writer of the Year at the 47th annual Hennessy Literary Awards last March. Aaron Finnegan won the First Fiction category and Louise G. Cole was the Emerging Poetry winner. An interesting twist from a marketing perspective with the awards this year was how some of Dublin City’s most famous bars mysteriously changed names overnight. For 48 hours Toners Yard, The Waterloo and Reillys were known as Tobin’s, Finnegan’s and Cole’s, respectively, to celebrate new Irish writing and the literary achievements of the winners. 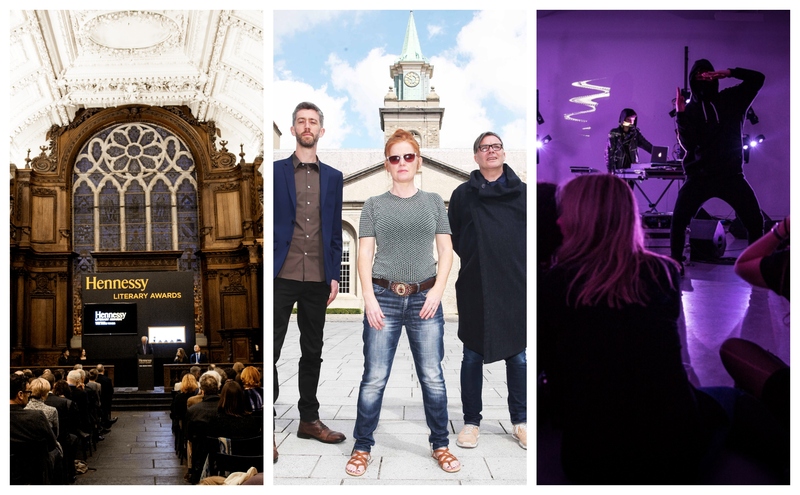 Hennessy formed a unique partnership with IMMA in 2016 to help fund the purchase of important works by Irish and Ireland-based artists for the National Collection of Modern and Contemporary Art. One of the works purchased this year, Barbara Knezevic’s sculptural arrangement ‘The Last Thing On Earth’ (2016), illustrates this point particularly well. It is framed by the proposition: ‘What if this is the last thing, the final material to be pulled out of the ground, the final piece of stuff that has not already been purposed by humans’. The ‘thing’ referred to here is a multi-sided marble object at the centre of the work, around which a constellation of other objects including tripods, archaeological tools and an iPad are arranged. “The team at IMMA has brilliant ideas every year. They challenge us and we challenge them. We are very proud to be part of doing something for the future of Irish art to help to make it sustainable,” says O’Hara. “The association also gives us a credible platform and a different environment in which to showcase and sample the product.” An example of this was Hennessy being a drinks partner for the opening of the IMMA Collection: Freud Project in 2016, which was attended by around 1,200 people. At the Hennessy Lost Friday events held at the Royal Hibernian Academy (RHA) in Dublin, expert mixologists create bespoke Hennessy cocktails as well as hosting masterclasses. Started in 2016, these funky events feature a carefully selected blend of Ireland’s most cutting-edge and dynamic artists, musicians and poets spread across the RHA’s gallery spaces. Vanessa Moss, development officer at the RHA, believes Hennessy Lost Friday has managed to establish itself as the place to discover the best upcoming artists within Ireland’s creative community. “As an artist-led institution the most amazing part of our collaboration with Hennessy is the ability to work creatively whilst also having the power and support of an internationally recognised brand behind us,” she says. Hennessy Lost Fridays act as a fundraiser for the RHA with all profits from ticket sales going to support its work. Numbers are restricted to 350 per event and normally sell out within a couple of days. The fact that Hennessy has brought in its own teams of mixologists, digital creatives and marketing people has also made a big difference to the initiative, notes Moss.